Playing the game your squad goes through 30 missions (some very easy and some super hard) taking on an enemy army and targets. Moving your troopers thru clicking the location you want them to go to on the screen, as well as clicking on the enemies you want to shoot, or moving the crosshairs to other non-human targets to use airstrikes, grenades, or rockets. Command points earned thru game play can upgrade your weapons or available personnel for the next mission. There are also medals that you can use to give your troopers a permanent skill upgrade. But user beware if your troopers are K.I.A. they are gone for good. And you start the next mission with new troops who have not been upgraded. While hitting the mark with well-designed levels, different mission scenarios, good graphics, and fun missions, Tiny Troopers misses the mark with some levels being a lot harder than expected or needed, and non-intuitive trooper movement issues. 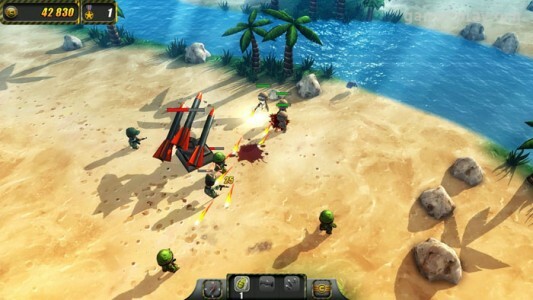 Overall Tiny Troopers is a fun, action packed little game.